Hillary Clinton hair attacks, from the headband to the wig. 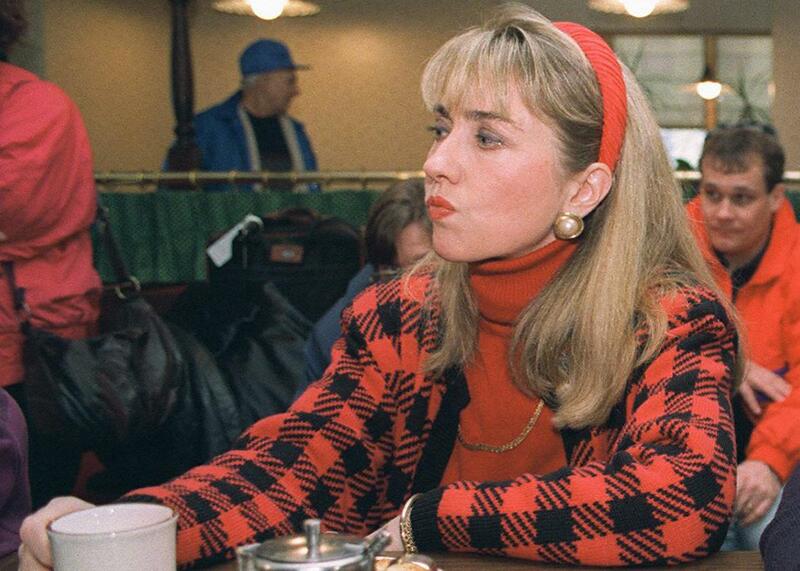 Hillary Clinton, in Bedford, New Hampshire, on Feb. 16, 1992. Conservatives are trying to gin up another national round of jeering at Hillary Clinton’s hair. For the last several days, the Drudge Report has been hyping the idea that Clinton wears a wig; one of his headlines said, “Wigged Out: Hillary Gives Up Hair Battle.” Yesterday Donald Trump picked up on it, speaking about Clinton’s alleged wig to the right-wing radio host Mark Levin. “I tell you what, it really was shocking to see it,” said Trump, who, to be fair, probably does know something about fake hair. The rumors reached the point that Clinton’s hairstylist denied them to People. None of this has ever just been about Hillary Clinton. Rather, she’s been a symbol of the public opprobrium that awaits any professional woman who doesn’t get her hair right. (This is all magnified and fraught in particular ways, of course, for black women.) Unlike their male peers, women can’t just go to the barber and get their hair shorn off—at least, they can’t do it without it being seen as a major statement about their identity, as opposed to a convenience. If hair starts to go gray, women are often well advised to color it, though doing so is expensive and time consuming, because they are penalized for appearing to age. Some women are lucky; their hair naturally falls in a nice way, or they enjoy styling it. The rest of us have to awkwardly experiment and then spend valuable time fixing it every day. It’s a sort of lady tax, and Clinton has been paying and paying it. Five years later, when Clinton ran for Senate, she briefly seemed to get it right. “[I]f she manages to sustain this new, understated elegance, chances are good that she will achieve one of her goals: People might actually stop talking about her clothes, her hair—even her choice of shoes—and finally concentrate on what she has to say,” said a New York Daily News piece. Alas, Clinton’s vigilance must have flagged, because people have gone on talking about her hair right up until today. There was a moment, in 2012, when Clinton thought she had a reprieve. “I feel so relieved to be at the stage I’m at in my life right now because, you know, if I wanna wear my glasses, I’m wearing my glasses. If I, you know, wanna pull my hair back, I’m pulling my hair back,” she told CNN. Good Morning America even did a segment about her decision to fuss with her appearance less, as one does when reporting on the secretary of state. “Yes, here she is, as they say, warts, well, there aren’t really any warts and all,” said Martha Raddatz in a voiceover. “But there are freckles, wrinkles, those big, black glasses and some serious competition in the bad hair day department, and this was no stolen moment for paparazzi. This was a news conference.” Because really, when have we ever seen a senior government official show up at a podium with wrinkles, glasses, and unstylish hair? Given decades of media harassment about her appearance, it would actually be perfectly understandable if Clinton did decide to don a wig and stop wasting so much time on something so aggravating. But as the right is reminding us, women who shirk what Drudge calls the “Hair Battle” will be shown no mercy.